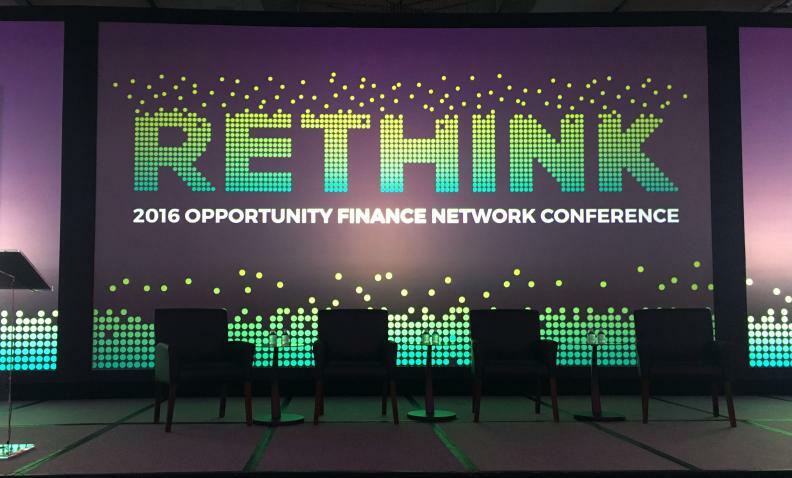 Last week I attended the Opportunity Finance Network conference, the annual gathering of Community Development Financial Institutions and those who work with them. As usual, it was a vibrant, optimistic gathering, filled with announcements of new supporters and good work being accomplished. Also as usual, it was a time to discuss and focus on upcoming challenges so that the field doesn’t rest on its laurels. If you hadn’t read the report CDFI Futures: An Industry at a Crossroads, which OFN published last spring with support from the Citi Foundation (as I admit I hadn’t, though I have now), some of the framing of the conference might have been a little baffling—there was a lot of talk about approaching a tipping point, needing to step up and make big changes, embrace technology, and the like. CDFI Futures, whose primary author was Jeremy Nowak, argues that the field is moving into a third phase—the first having been “proof of concept,” which legitimized the field, and the second having been growth and diversification. The paper argues that the third phase is (or should be) “capital transformation,” in which a highly competent, technologically savvy field with a handful of very large, national, easy to invest in CDFIs are closely networked and working collaboratively with the bulk of the field’s local and regional funds. That idea—that as conditions, contexts, and technology change, there is a need to adapt and perhaps create wholesale new systems and ways of working—was intentionally reflected in the theme of the conference—Rethink—and came up in many presenters’ speeches, from board candidates to plenary speakers. There is some very exciting potential out there, of course. We have long known that there is a growing group of “impact investors” who might really like to funnel money into CDFIs—if more of them realized CDFIs existed and how they worked. The potentials for making new systems to facilitate more of that kind of investing were discussed in the opening plenary. That’s likely true, and in general I trust the people working in the trenches to be very intentional about that. But I found some reasons to be concerned as well, and I know from watching the conference app activity that I was not alone. Stranger and even less expected was the bizarre keynote speaker at the organization’s membership meeting. Barry Libert, author of The Network Imperative, delivered a well-nigh incoherent lecture in which he tried to imply that CDFIs were not focusing on the human side of their work enough because they didn’t have the word “people” in the name of their organization, and that Amazon, Uber, and AirBnB were the moral model of the future because they understand how people want to be brought into networks with each other. Never mind that they make their profits off some truly exploitative, anti-people, anti-economic justice business practices, which are indeed reliant on tech and networks, but not on any particular increase in meaningful human connection. (Also they don’t have “people” in their names either.) Uber, in fact, recently got into predatory car lending of the sort that is exactly what many CDFIs were formed to provide alternatives for. The tease for his talk—what CDFIs could learn from the kind of tech and networking approaches that these companies use—was promising, and I’m certain there is in fact a lot to learn there. Many CDFIs could benefit from all sorts of use of tech and the power of networks, and I was intrigued to hear some insights on the possibilities. But there was actually nothing of the sort in Libert’s talk, while his lack of grasp of the principles of economic justice made him a very bad fit for a field for whom maintaining a clear identity and moral center as it moves mainstream is one of the challenges of the day. I hope his selection was just an unfortunate misstep. The good news is, it certainly felt like an anomaly among the buzz of celebration and activity concerned with the business of using lending to advance equity and justice, from co-op conversions to discussions of racial equity to advancing health communities. It was also wonderful to see the organization walking its talk on diversity of speakers (beyond just tokenism). (See Twitter, #OFNConf for more of my and other’s reactions and report outs.) I look forward sharing many of the voices and stories that I met and learned about with our readers over the coming year.